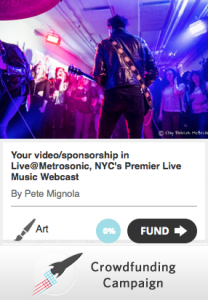 Music video promotion featured in Live@MetroSonic Rocket Hub campaign ! Live @ Metrosonic is a live music webcast series that we host at Metrosonic Recording Studios in Brooklyn, NY and live stream directly to YouTube and on our very own website, Metrosonic.net. We’ve turned to crowdfunding to help us raise additional funds so we can deliver the highest quality production possible more often, showcasing musical talent everyone can appreciate at least once a month. We’d love to host our live events every Friday if we could – and that’s where you come in. We think we have some of the best crowdfunding perks available. One reward we are really excited about is our music video promotion opportunity. If you’re in a band and have a music video, or you are a comedian, cartoon animator, visual, dance or performance artist, we’ll place your video in our broadcast along with a link for the audience to follow & view your entire video. We’re also offering advertising time, open tickets to any show of your choosing, music mixes, video & commercial production, and a few other fantastic options including our Executive Producer level, which would give you or your business marquee sponsorship of the broadcast. 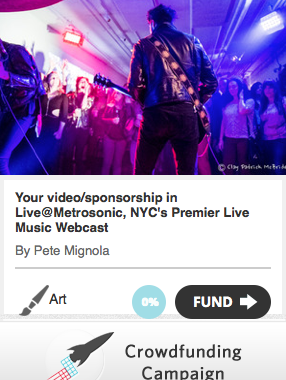 Follow the link below to learn more about our crowdfund project and join us in making Live@Metrosonic NYC’s Premier Live Music Webcast! Posted in Deals and Special Packages, Promotions & Contests, Video.